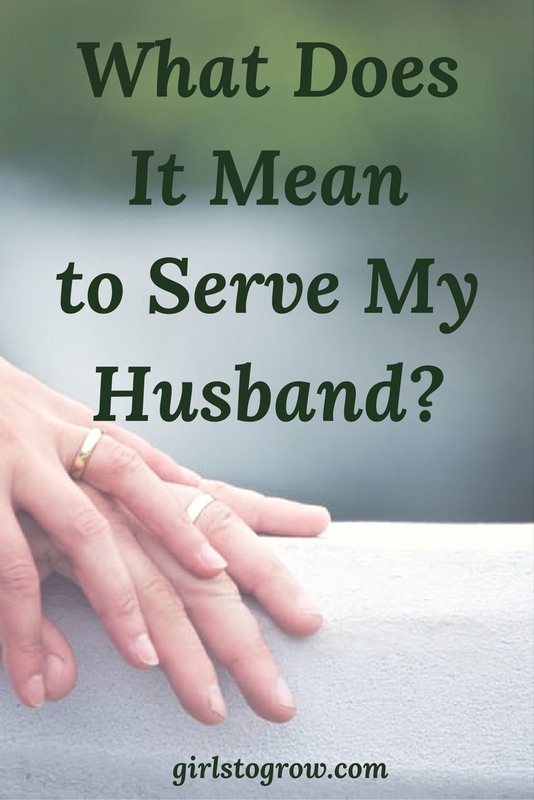 What Does It Mean to Serve My Husband? My husband and I have been married for 25 years. That sounds like a really long time! Over these years, I’ve developed so much love and respect for him. He’s a man of character, a wonderful provider for our family, and a wise, loving father to our girls. You would think that knowing the great man that he is would have me scrambling to serve him at every turn. But in spite of all that I admire about him, it’s often not enough to motivate me to want to wash his clothes, iron his shirt, pack his lunch, or cook his meals. You know who my heart naturally wants to serve? Myself. While sometimes my love for my husband is enough to propel me to do all those things that will benefit him, too often I’d rather neglect them, or push them aside, so that I can do what I want to do. Why am I even concerned about serving my husband? Jesus said in Matthew 23:11, “But he that is greatest among you shall be your servant.” I know from Jesus’ own example in His earthly life that if I want to be like Him, then I will serve others. What better place to start than with my closest earthly relationship? I also like this reminder in I Peter 4:10. “As every man hath received the gift, [even so] minister the same one to another, as good stewards of the manifold grace of God.” As I minister to and serve my husband, I am stewarding or managing the amazing grace that God has shown to me. I’m demonstrating God’s grace to someone else, in this case, the one I’ve vowed to be with for the rest of my life. So what exactly does it mean to serve? One dictionary definitions says “to perform duties or services for another person.” I can handle that one. But another one I saw said “to be a servant.” Talk about humility! Signing up to be a servant to anyone is not something I instinctively jump to do. Yet that’s exactly what Jesus did when he washed the disciples’ feet in John 13:3-5. I like the way this particular definition is framed – “to render assistance; be of use; help.” I think that one best describes what I want to be for my husband. In fact, it relates to my calling as a wife, as God created Eve to be a “help meet” for Adam. I certainly need the Holy Spirit’s help in this area. If my goal is to make my husband’s life easier, I think I need to start with these three basic principles. 1. It’s an attitude. I think a right attitude comes first. I can perform the actions without this, but I think my husband would sense that it’s not genuine. If I want to check myself, I can ask, “Is my attitude about doing this for my husband the same as if I were doing it for Christ?” Would I complain about serving Him? Sometimes it means we overlook a habit that annoys us, or demonstrate patience when we feel like we’ve served enough. 2. It’s actions. I think serving my husband starts with the right attitude, but if that attitude doesn’t display itself in actions, I’m not really serving! I think this looks different for every couple. What does YOUR husband like? Mine likes a hot breakfast most mornings. Your husband may not care about that one bit. What specific actions show him that you are wanting to help him? Do we only serve our husband when he’s in a good mood and treating us well? No. I think that’s where the love of God can really shine through us. We can be lovely even when he’s not. It is, however, an act of the Spirit through us, since it’s not our natural reaction to serve a person who’s not loving us in the way we want to be loved. This Friday my husband and I will be celebrating our tenth wedding anniversary. He's not Christian – yet – but I'm often looking for ways to serve him more as a believing, Christ-following wife. Thank you for these tips. I need to pray more for him and for me to be more Christ-like in my actions and behaviours. Congratulations on ten years of marriage!! Trusting that God will continue to work in the heart of your husband and bring him to salvation, and that God will grant you the grace you need to be a testimony to the love of Christ. Hope you have a wonderful week, too! Excellent post! For me, it's the attitude that's the hardest. I'm so selfish, and I just want him to help me. But that's not the way God made us, and it's not how I should serve Christ. So I pray that God will change my attitude. I can so relate to you here. I have a wonderful husband and would think serving him should be way up on my list. Unfortunately, he often gets the least of me. Thank you for these 3 important principles, Tracey. I certainly needed this reminder! Thank you for stopping by the blog, and taking the time to comment! Have a great day!! Excellent article Tracey! I shared it with on all my social media. God bless you! Thanks so much for the encouragement and for sharing this post! I'll definitely stop by and say "hi!" This is so timely for me right now!!! A word in due season. THANK YOU!!! You're welcome 😉 Trust all is well with you and your family! Thank you for sharing this! We've only been married for two years, but I definitely can improve on serving him. Sometimes I get so caught up in the other things I have going on that I forget how important it is that I serve him, and that when I serve him I'm also serving Him. Thanks again! Appreciate your stopping by the blog and taking the time to comment! I, too, often need a reminder that when I serve my husband, I'm serving the Lord. Oh, I am definitely still in the learning process myself!!! Such a good and NEEDED article for us ladies to read and remember. My husband and I will be celebrating 24 years this summer and still we need to remember these simple yet profound truths. Serve with a true heart, love out of a desire to see them through Christ's eyes, and pray for them as only a soul warrior who knows their hearts can. Stormie's book is one of my favorites. I’m not married yet but I am in practice for when God do send him I’m equipped and prepared for what I am asking. My three girls father passed to a hit and run 7years ago and its are desire that God send His best into are home. Continue to pray for me and my girls as we await patiently for God to send him!!!! Trusting that God will answer your prayers for a husband in His time. Love that you’re already preparing yourself to be the wife God would have you to be! !